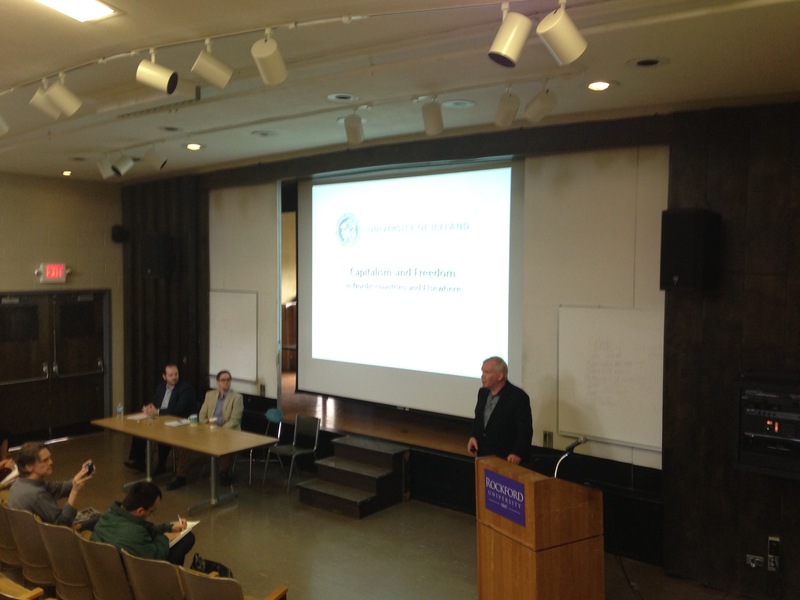 Prof. Gissurarson at Rockford University. RNH Academic Director, Professor Hannes H. Gissurarson, gave three lectures in the United States in the spring of 2016, comparing the Nordic economies in Sweden, Denmark, Finland and Iceland on the one hand and the Nordic economies in Minnesota, Manitoba and South Dakota on the other hand (leaving out the oil-rich states of Norway and North Dakota). Living standards turned out to be significantly better in the Nordic economies of North America. Professor Gissurarson argued that this was because in North America more opportunities were available to produce oneself out of poverty. It was true, he submitted, that the Nordic nations in Europe had managed to develop an attractive system of affluence and security, but that this had happened despite, but not because of, high taxes and efforts at redistributing income. It should be emphasised that the Nordic economies were open and relatively free, protected by the rule of law.